The boy-wonder who broke Hikaru Nakamura’s record as America’s youngest Grandmaster, Fabiano Caruana has scaled the chess mountain and reached the peak. This young Grandmaster has been ranked as high as number 2 in the world and has won numerous tournaments in his career. In 2018, the American faced Magnus Carlsen in the World Chess Championship 2018 in London, losing in the rapid tiebreaks. Fabiano Caruana was born on July 30, 1992 in Miami, Florida. His natural grasp for chess was discovered at the age of 5 in an after school chess program when he moved to New York. His first chess coach was National Master Bruce Pandolfini, a well known chess author. Caruana later was coached by Grandmasters Miron Sher and Alexander Chernin. He became a FIDE Master in 2002 and an International Master in 2006. A year later, at the age of 14 years, 11 months, and 20 days, Caruana became the youngest Grandmaster in the United States and Italy. Shortly after earning the Grandmaster title, he won the Italian Chess Championship, becoming the youngest ever Italian Champion. The Italian Grandmaster kicked off 2008 by winning the Tata Steel Group C section, earning him a spot in 2009's Group B event. Caruana then made his Olympiad debut in the same year, representing Italy from top board in the Dresden Olympiad. After a 7.5/11 finish, Caruana then won the Italian Championship again, earning back-to-back titles. He finished the year entering the world's top 100 players in October, with a rating of 2640. In 2009, Caruana won the Tata Steel Group B after beating English Grandmaster Nigel Short in the final round. After strong performances in both the Russian Team Championships and the Mitropa Cup, Caruana was nominated to play in the 2009 World Cup in Khanty-Mansiysk, where he beat Lazaro Bruzon, Lenier Dominguez, and Evgeny Alekseev before losing to Vugar Gashimov. After missing the 2009 Italian Chess Championships to compete in the FIDE World Cup, Caruana won the event twice more in 2010 and 2011, his fourth and final time winning the Italian Championship. By then end of 2011, Caruana had jumped in the world rankings, reaching #17 in the live rankings, and a rating well over 2700. In 2012, Caruana continued to improve. After a second place tie in the A section of the Tata Steel Tournament, Caruana went on a streak, winning first in the Reykjavik Open, Sigeman and Co Chess Tournament, and the Dortmund Sparkassen Chess Meeting. Within the same calendar year, Caruana also finished second in both the Tal Memorial and the Grand Slam Chess Final. By January 2013, Caruana was ranked fifth in the world rankings, with a rating of 2781. Caruana spent much of 2013 trying to qualify for the 2014 Candidates Tournament through the FIDE Grand Prix. After placing third in Zug, second in Thessaloniki, and winning the circuit in Paris, Caruana had amassed 380 points, narrowly missing out on automatic qualification to the Candidates Tournament. In 2014, Caruana finished second in both Shamkir Chess and Norway Chess, behind Carlsen in each event. Caruana won a silver medal in the World Rapid Championships in Dubai, just a half point behind first place. He then represented Italy from first board once again at the 2014 Olympiad in Tromso, Norway. Upon the conclusion of the Olympiad, Caruana then returned to the United States, where he won the Sinquefield Cup with his memorable seven game winning streak. With a performance rating of 3080, Caruana arguably had the best tournament performance in chess history, beating Hikaru Nakamura, Levon Aronian, Maxime Vachier-Lagrave, Vesilin Topalov, and most notably, reigning World Champion Magnus Carlsen. Each of the players in the double round robin were ranked in the world top ten prior to the tournament, and the 8.5/10 final result saw Caruana's rating reach 2844, his personal best rating. At the conclusion of the event, Caruana was the second highest rated player in the world. After a historic performance at the Sinquefield Cup, Caruana returned to the FIDE Grand Prix, determined to qualify for the Candidates Tournament in 2016. In October 2014, Caruana tied for first with Boris Gelfand in the opening leg in Baku, Azerbaijan. To close the year, Caruana tied for fourth in Tashkent. In May 2015, Caruana tied for first in Khanty-Mansisyk alongside Hikaru Nakamura and Dmitry Jakovenko, the final leg of the FIDE Grand Prix. The tournament win meant that Caruana won clear first in the 2014-2015 FIDE Grand Prix, and thus automatic qualification for the 2016 Candidates Tournament. Caruana showing his GP trophy (and a smaller copy of it). | Photo © Kirill Merkurev. Now qualified for the Candidates Tournament, Caruana used his dual citizenship to switch back to the American federation. When he joined the American team, Caruana joined Hikaru Nakamura and Wesley So, with the hopes of winning an Olympiad for the United States. In the same year, Caruana won clear first in the Dortmund Sparkassen Chess Meeting, and reached the fourth round of the FIDE World Cup in Baku, eliminating both Rauf Mamedov and Anton Kovalyov before falling short against Shakhriyar Mamedyarov. In 2016, Caruana started the year taking second at the Tata Steel Chess Tournament, finishing just a point behind Magnus Carlsen. The twenty-three year old entered the Candidates Tournament as the third best player in the world. The 2016 Candidates Tournament was held in Moscow, Russia, and alongside Caruana, featured the world's best players: Viswanathan Anand, Sergey Karjakin, Peter Svidler, Hikaru Nakamura, Veselin Topalov, Anish Giri, and Levon Aronian. Needing to win the Candidates to clinch a match with Magnus Carlsen in the World Chess Championships, Caruana headed into the final round tied for first with his opponent, Karjakin. Despite the level score, the Candidates tiebreaker (most wins) meant that Caruana had to play for a win with Black in order to win the Tournament, as a draw would favor Karjakin. The Russian Grandmaster ultimately beat Caruana, and became the 2016 World Chess Championship Challenger. Despite falling short in the Candidates Tournament, 2016 turned still out to be a great year for Caruana. He won his first ever U.S. Chess Championships, and returned to Baku to help the United States win its first Olympiad Gold Medal since 1976. The Americans edged out the Ukrainians on tiebreaks, and Caruana won an individual bronze medal for this performance on first board. With his second place finish in the London Chess Classic, Caruana finished third in the 2016 Grand Chess Tour. In 2017, Caruana won his first chess.com Speed Chess Championship match against four-time Women's World Champion, Hou Yifan, 19-9. The American Grandmaster played for the Montreal Chessbrahs in the inaugural year of the PRO Chess League. Caruana helped the team win the Atlantic Division, but the Chessbrahs were eliminated in the semifinals by the Saint Louis Arch Bishops. Caruana nearly ensured qualification to the Candidates Tournament by rating when he beat Vladimir Kramnik in the first round of the 2017 Isle Of Man International. When Kramnik was later announced as the 2018 Candidates Wild Card, both Fabiano Caruana and Wesley So qualified to the Candidates tournament by rating. To finish the year, Caruana won the London Chess Classic after beating Ian Nepomniachtchi in a blitz tiebreak match. 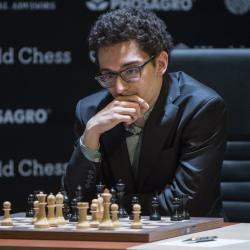 Now in his second Candidates Tournament, Caruana made the most of his opportunity in Berlin. After losing a game late to the 2016 World Championship Challenger Sergey Karjakin, Fabiano Caruana beat both Levon Aronian and Alexander Grischuk in the final two rounds to secure his berth into the 2018 World Chess Championship Match against Magnus Carlsen. Following his Candidates Tournament win, Caruana had an impressive string of results. The American won both the GRENKE Chess Classic and Norway Chess, finishing ahead of Carlsen in both events. Caruana placed second in the 2018 US Chess Championships, and tied for first in the Sinquefield Cup (with Carlsen and Aronian). In jointly winning the Sinquefield Cup, Caruana played a tiebreak match with Wesley So for the final spot in the London Chess Classic, which he won, 1.5-0.5. Prior to the World Championship Match in London, Caruana would lead the United States to a silver medal in the Olympiad in Batumi, Georgia. He also participated in the 2018 Speed Chess Championship but was eliminated in the first round by Levon Aronian. After years of hard work to win the Candidates Tournament, Caruana finally got his chance to play Magnus Carlsen in the World Chess Championship. The match famously saw each of the twelve games end in draws, and Carlsen claim the tiebreak by winning each of the three rapid games. A month later, Caruana won third place in the London Chess Classic after beating Levon Aronian in the third place match. The result also meant that Caruana finished third overall in the Grand Chess Tour. In the 2019 PRO Chess League Season, Fabiano Caruana is currently playing for the Saint Louis Arch Bishops in the Atlantic Division, guiding the team to another appearance in the PRO Chess League Live Semi Finals in San Francisco. Fabiano Caruana is competing with the Saint Louis Arch Bishops at the 2019 Pro Chess League.